"The human brain is hardwired to connect with others, and our normal development depends upon relationships to nurture the self-regulatory circuits that enable emotion to enrich, rather than enslave, our lives. Traumatic events tear apart the fabric of psyche and family, but emotions, when somatically and relationally regulated, can become extraordinary catalysts for the healing transformations that are the heart of the change process. 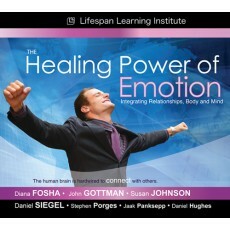 Emotion is a term that evokes many connotations, from the way we "feel" to the ways our lives are integrated across time. Specific emotional states may include such terms as love, joy, pain, touch, fear, anger, gratitude, grief, care, sexual arousal, awe, shame, excitement, compassion, contact and closeness. These and many other emotions are examined from a scientific and practical approach as we delve into the central role of our subjective worlds. CE Credit at no extra cost when you pass the online test with a score or 80% or better. Select the type of CE credit you require, Remember to include your License # at checkout and we will send you the test link in a separate email. 1) Define and utilize brain plasticity. 2) Apply polyvagal theory with trauma patients. 3) Track meta-emotion in moment to moment interactions.